and houses with no one home. Bombay City can be too. Art is at the heart of joy and learning, and explaining the world. It is our lens. Paradise Lost is proof. Thank you, Cindy. The city with the soon to run out water was Cape Town. It would be an unparalleled disaster. It is such a big city, and has huge poverty stricken areas. It is a city we are due to visit soon. Some narcissists don’t really care about future generations, even of their own family. One currently prominent one comes to my mind. They are so wrapped up in themselves and what they are doing, they have very little concern for anyone else. At most they would care about one narcissistic extension, a daughter, son, or someone they mentor who they view as a narcissistic extension of themself. This is as far as concern for others goes with them, and it is a self reflected concern at best. 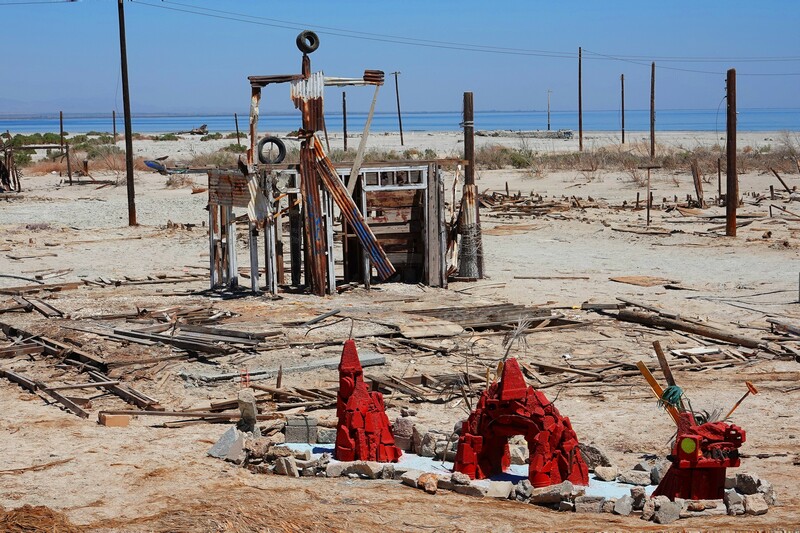 Your series on the Salton Sea is quite good, Cindy. Until 1995, I managed the plant operations for the geothermal plants out there. Became very familiar with the area and wildlife. Well done. I know there a quite of few of them 10 or 11, and Warren Buffet was going to build a big one, but the word is, he no longer will. I know some of them are excellent birding sites. I would be fascinated to learn more about your experiences out there and your leads on the best birding sites at the plants! Winter is interesting because the Canada snow geese migrate to the area, mostly around the plants. Thousands of them. At dusk they return from feeding to bed down in the fields, wave after wave. Pretty impressive. Plenty of owls, coyotes. You always to to watch for rattlesnakes and scorpions. The big plant you’re referring to was actually in planning before Buffet bought us out with his MidAmerican group. There were a lot of cost prohibitive issues with that size of a project. A year after the buyout, I decided to form my own consulting business and went international. The people MidAmerican brought in didn’t really get it. 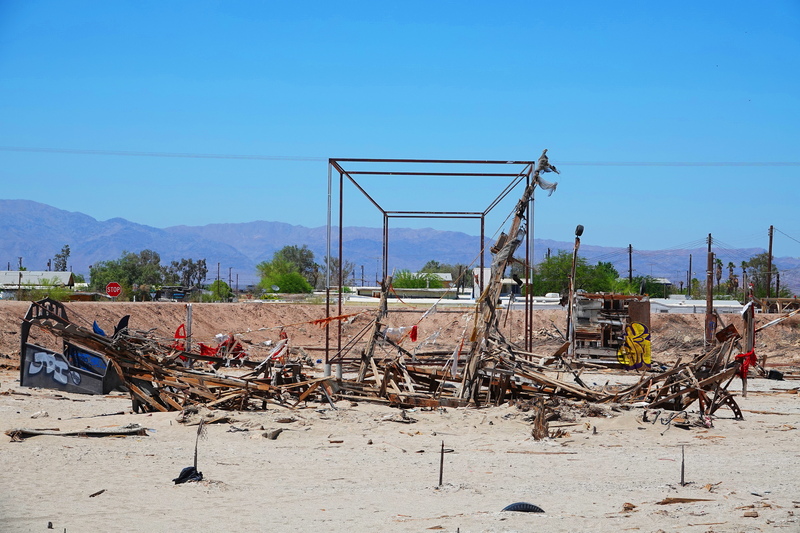 There used to be a Salton Sea wildlife visitor center at the south side of the Sea, not too far from the geothermal plants. 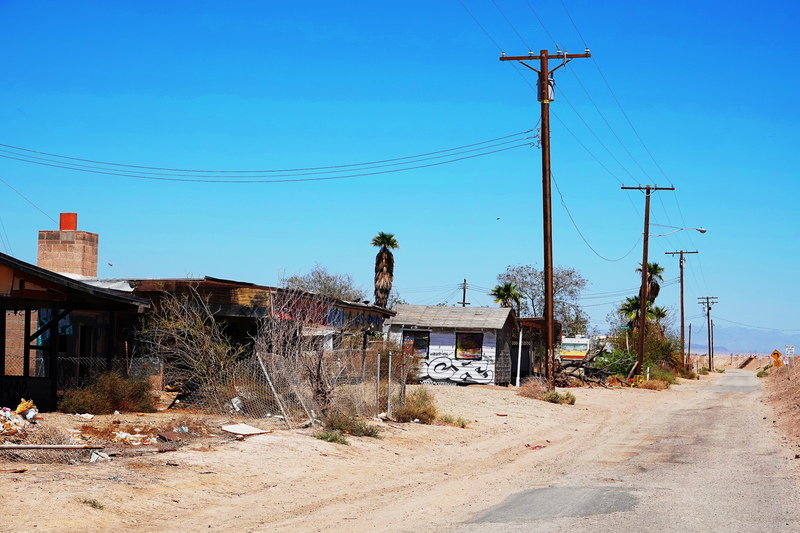 If it’s still maintained they’ll have some good information…..maybe on Gentry Road, in Calipatria. Yes, there are two Sonny Bono wildlife centers to the south, which are excellent birding sites in winter and I have seen the snow geese as you describe, and large flocks of cranes, along with many other fascinating birds. I would love to see more burrowing owls and harriers but have only seen each, once. Coyotes, rattlesnakes, scorpions and black widows are ever present at The Holler too, and I am super aware of avoiding them. There are also pumas at the sea, but I have only seen the tracks. What sorts of owls have you seen and where/when? Did you take photos when you worked there? 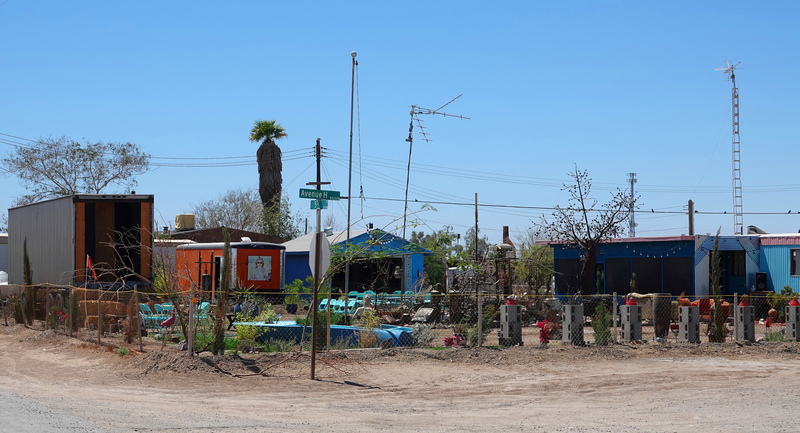 Best way to see burrow owls is to drive along the dirt access roads that follow the irrigation canals, which are plentiful around all the farm fields. The owls dig holes between the dirt and the cement walls of the canals. Thanks Rob. I will keep looking! Scrap metal and trash discard scarecrow, yes. The sadness feels all the more intense, seeing the brave creativity that resulted from it. A poignant but important post, Cindy. Well done, my friend. Hugs on the wing! Last time I shared some of the wildfowl, struggling to exist in their traditional home of The Salton Sea in California. This week Cindy shares the sad sight of the beach resort of Bombay City where the residents are creating artwork from the chaos. There is also a link to an article about the crisis. As always Cindy’s photographs tell the story very eloquently. I thought that was neat! I liked that old ship! Thank you for your thoughtfulness and your support. It is lovely to meet you! 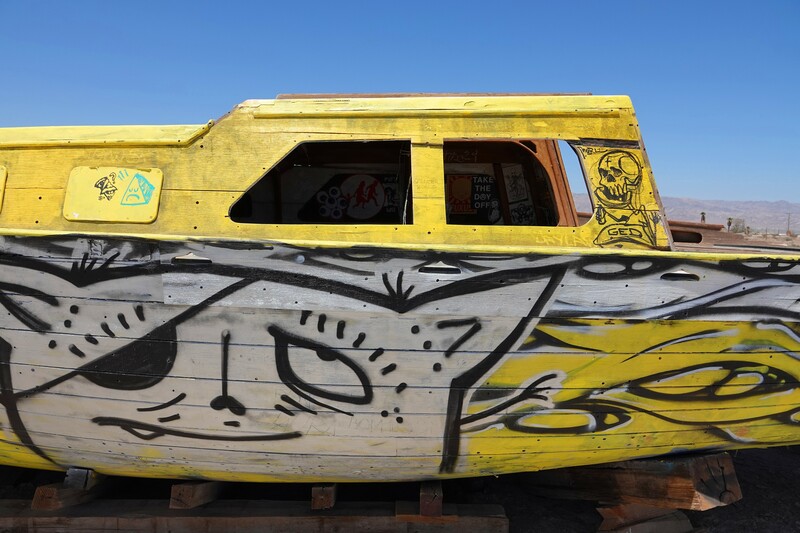 Making art from trash–Very hopeful ! The Daily Mail link is also encouraging. 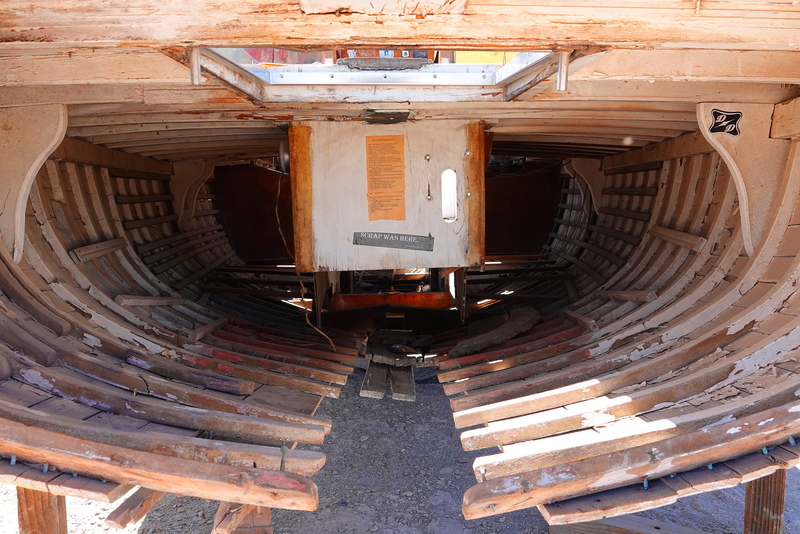 Great photographs, especially the boat. That’s quite a statement. I do appreciate yourcontinuing to document this stiry. Well, it is a stirring story. Also, theboat I mentioned is the one that looks like a walking fish, symbolic perhaps of a certain devolution thats going on today. Oh how interesting! I didn’t see this, but now I clearly do! Thank you for enhancing my perception and for caring about The Salton Sean. Frohe Wochenende mein lieber Freund Klaus und danke schoen! Beautiful in a sad & haunting sort of way. 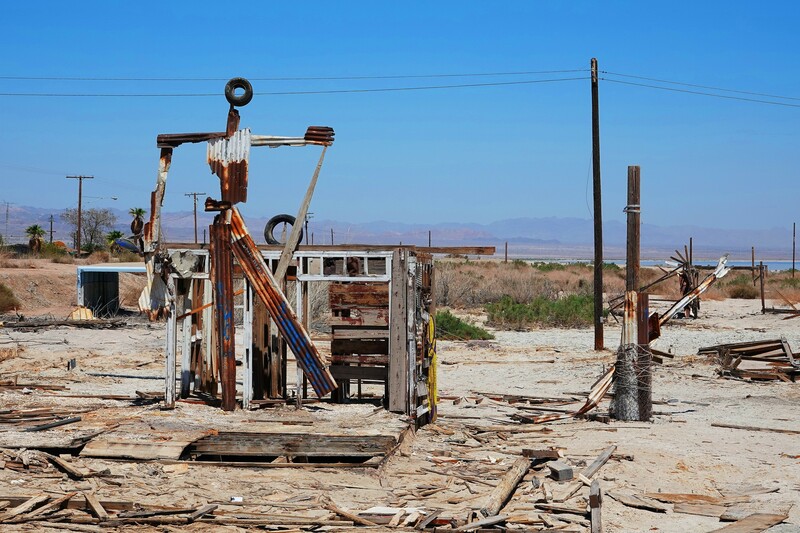 It reminds me of some of the abandoned, broken down buildings, equipment, and artwork we saw along historic Route 66. That’s cool. I can honestly say I’ve never seen anything like that. Love the bright yellow wooden boat, too. Cindy, I loaded this page and read if offline, but the images didn’t load.. next time at the cyber I reloaded, and read at home – wow… that is a unique place, and I wondered if you could sense any negative energy from it being basically abandoned/desolate.. after the earthquake hit jama, every time I returned, I felt a really heavy energy, and every day there I felt it physically… it’s as if that moment of horror, of death, of destruction is trapped there – as if it needs a cleansing… when i looked at the images here, i loved what i saw, yet i sensed that same feeling of sadness…. hope this makes sense. your posts are always a joy to admire! 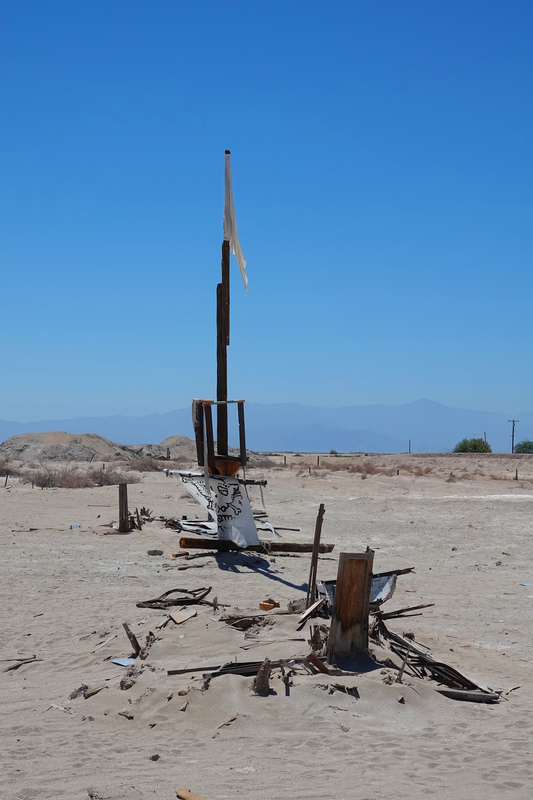 I feel a complex set of emotions every time I visit The Salton Sea.These towns are not abandoned. I feel sadness for the harshness of people’s lives here and this deep abiding respect for their perseverance. I feel anger that people are outcast like this and ignored, and worry about the physical and psychological effects of this place on children. I feel distress for the environmental degradation, and amazed at the beauty and endurance of the birds. 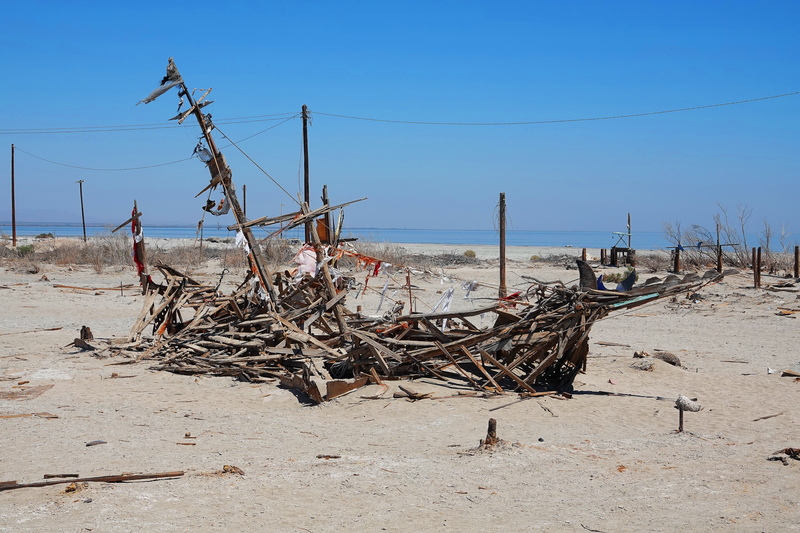 The Salton Sea is a microcosm for me of civilization, and it all it’s attendant discontents. Thank you for your sensitivity and for asking how I feel. It felt good to express it. Indeed. Art is the creative impulse and the resulting expression. 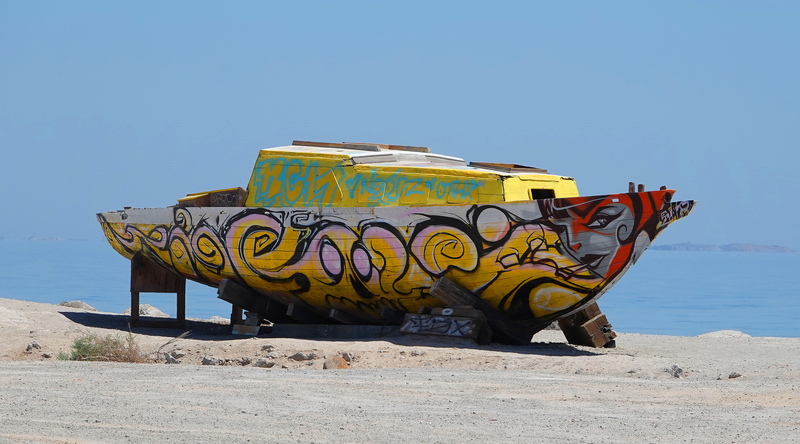 Art can be found in the saddest of places – it just has to be looked for! I love this piece and all of its pictures. While sad, it made me smile. So much to sniff out and find! Next time, let’s bring Wolfie. It would be so wonderful! I always love the stories in your photos, Cindy. Here, heartbreaking despite artistic resilience, such a cautionary tale of our environmental messes and missteps, sometimes with good intentions but . . . often lacking proper care and followthrough. When will we properly respect our earth’s sensitivity? Thanks ever so much for the article link, as well. Be well, continue to walk in beauty. WE often see through your eyes. Thank you. Ahhh, such a heartwarming, thoughtful, and insightful comment. I am touched by you. Thank you. I was reading a book by a paleontologist recently who wrote about earth’s five great extinctions and how the sixth may well be anthropocene, created by us. He explained that if the history of the earth were collapsed into a 24 hour clock, humans have been here for barely over a minute. Our species packs a lot bang for our buck, planetary and time wise. 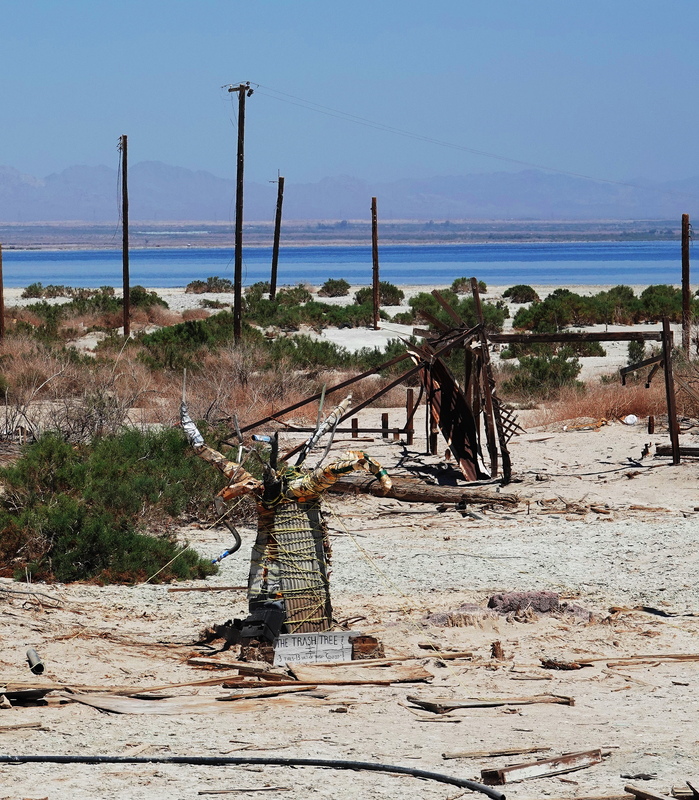 When I go to The Salton Sea, this is what I see and feel. I feel extinction encroaching, and people avoiding. It is scary to contemplate, isn’t it? I sometimes think that maybe because we live at a time when we have so many things and so much that is considered disposable, we Still (despite our knowledge) take for granted this earth and as well as resources such as clean water, air, and soil and consider them ever-replenishing. I fear for a future when it may be too late to be more careful. I share your feelings exactly. Another interesting series of photographs. You’ve captured a sense of destitution. Yes, and you feel it. Thank you Robert. Desolation station… can really sense it through your lens. Kudos to the graffiti artists though! Aren’t the artists awesome. Art from desperation is powerful and real. The old name of the city where i live now is Bombay!!! Surprised to see it here ! !